Make no bones about it, Little Vincent's can be a bit intimidating to the uninitiated. A grumpy man awaits your order, and even during light periods has no time for you to make up your mind. The good news is that it is not so hard to order a slice, and you can't go wrong with that here. A plain slice ($2.25, below) is good enough on its own, but for an extra 75 cents you can ask for it to be heaped with cold cheese on top. It's not listed somewhere, you just have to ask for it. 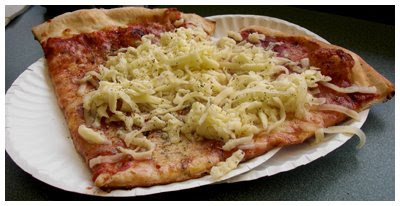 The cheese starts to melt on the hot slice, and is definitely a unique experience. I think whether or not you select it is probably just based on mood and hunger.